Samsung’s hybrid pocket watch concept raises a lot more questions than it answers. That’s due, in part, to the fact that the company isn’t offering all that much information about what appears to be an analogue pocket watch with smart functionality announced in a press release tied to the Baselworld jewelry and watch show happening next week in Switzerland. This isn’t the first time we’ve seen someone take a crack at the idea, though aside from an Indiegogo campaign for an “open-source anti-smartphone” and some 3D printed at-home hacks, no one has seemingly really dared to go full throttle into the niche upon niche that is the smart pocket watch. Chances seem pretty slim at this point that such a device will ever see the light of day, even from Samsung, a company notorious for flooding store shelves with a million different variants on a given theme. Even so, the time is right for companies to start making big, bold, weird experiments in the wearable space. The smartwatch category has suffered, in part, from a flooded market of likeminded devices. Smartphones are one thing. The technology quickly transformed from luxury to perceived necessity. Smartwatches aren’t nearly there yet – and at this rate, may never be. For now they’re, at best, a proxy for our smartphones. A few companies (Samsung included) have had enough success for the space to make sense, but the rest of the competition is essentially fighting over scraps. If nothing else, Samsung’s hybrid pocket watch raises some interesting points about the space. Like, if a watch isn’t designed to be worn on one’s person, can it really be classified as a wearable? How much of the wearable category’s value is derived from the body real estate it occupies? Devoid of a wrist strap, doesn’t the thing more or less become a tiny, much less useful smartphone? 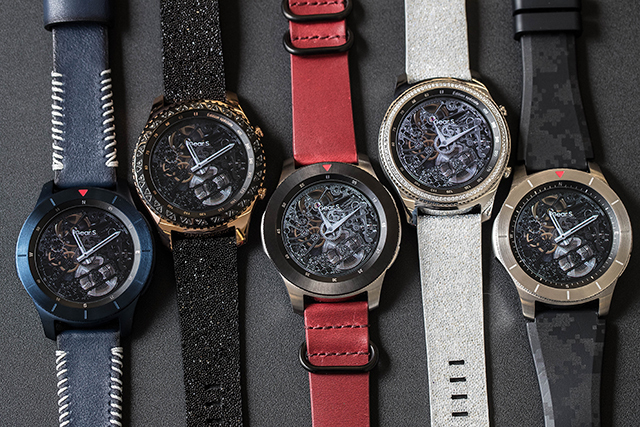 Samsung is also showing off a number of devices created alongside Swiss watch designer Yvan Arpa, which, like the pocket watch, appear to exist more to bolster the profile of the company’s existing product than to hint at any forthcoming release. After all, the super luxury smartwatch may be the greatest niche of all. Sure, Tag has had some relative success with its Connected device – at least enough to justify a second generation of the product – but four digits is a lot to ask for a product designed to be upgraded ever couple of years. Even the nicest smartwatch likely won’t be getting passed along to the grand children.